On the day of setting its foot in Madurai with two new flight services, IndiGo, a low-cost airliner, on Wednesday announced introduction of its third flight from Madurai to Hyderabad on MarchIts inaugural flight that landed here from Delhi after a stopover at Chennai was given a water cannon salute by the Airport fire-tenders. “Madurai is our 37th domestic destination,” said its Director of Corporate Communications Ajay S. Jasra. 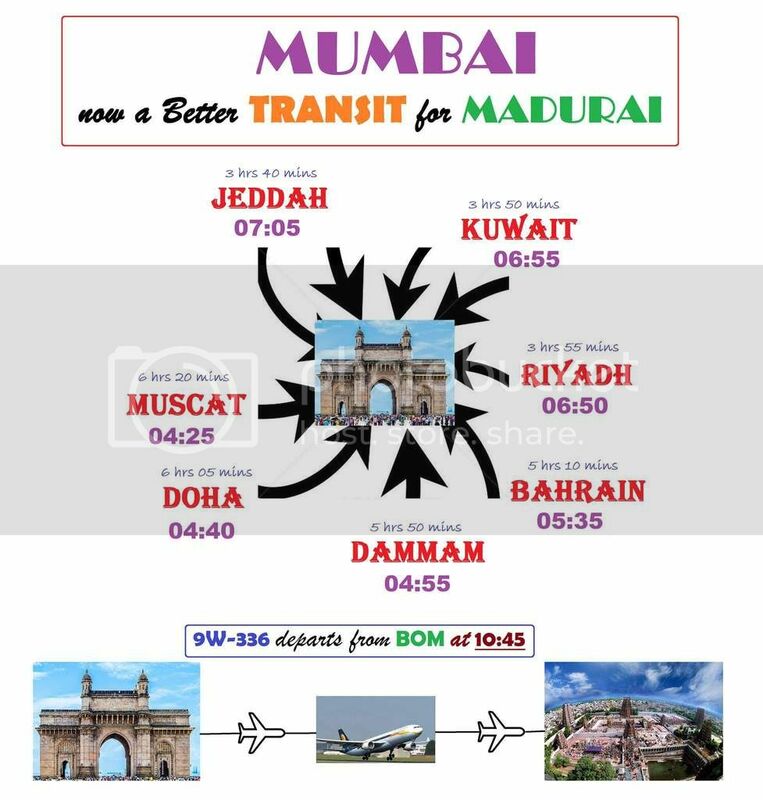 Besides, a New Delhi-Madurai-New Delhi (with touchdown in Chennai on both directions), the airliner has also simultaneously launched a Chennai-Madurai-Chennai daily service on Wednesday. “Our third service – Hyderabad-Madurai daily flights – will commence on March 26. We have plans to operate our international flight to the Gulf from here within a couple of months,” he added. Mr. Jasra also expressed IndiGo’s intention to fly out of Madurai to the Far East. IndiGo will be the 6th airliner to operate its services from Madurai after Air India, Jet Airways, SpiceJet, Sri Lankan Airlines and Air Carnival. “All our aircrafts are Airbus A320 with a seating capacity of 180 passengers. Wherever we go we operate daily flights with more options of connectivity to different destinations,” said its Senior Manager, Marketing and Communications, Nitin Arora. Stating that passengers would enjoy a very competitive airfare with IndiGo, he said though the pricing would be dynamic, the lowest prices would be between ₹ 1200 and ₹ 1900. IndiGo was known for its on time performance. So it is almost confirmed soon we are getting Sharja/Dubai and Singapore. Profound Thanks to Indigo Airlines for operating services from Madurai.Their as well as our hope of steady growth of passenger traffic from Madurai, will certainly entail more growth . eagerly awaiting the commencement of Indigo services to destinations like Sharjah, Dubai, Muscat and Singapore , as announced in Indigo's statements to press. Given such a potential , it is very regrettable, as the State owned Air-India as well as early entrants like Jet airways , confined their service only to Chennai and never beyond. We sincerely hope Madurai Airport breaks all the barriers and emerges as a successful, profitable entity. Ignore AI & Jet. As long as Indigo and SG starts flights to ME & FE, we are happy. We have decent domestic connection. 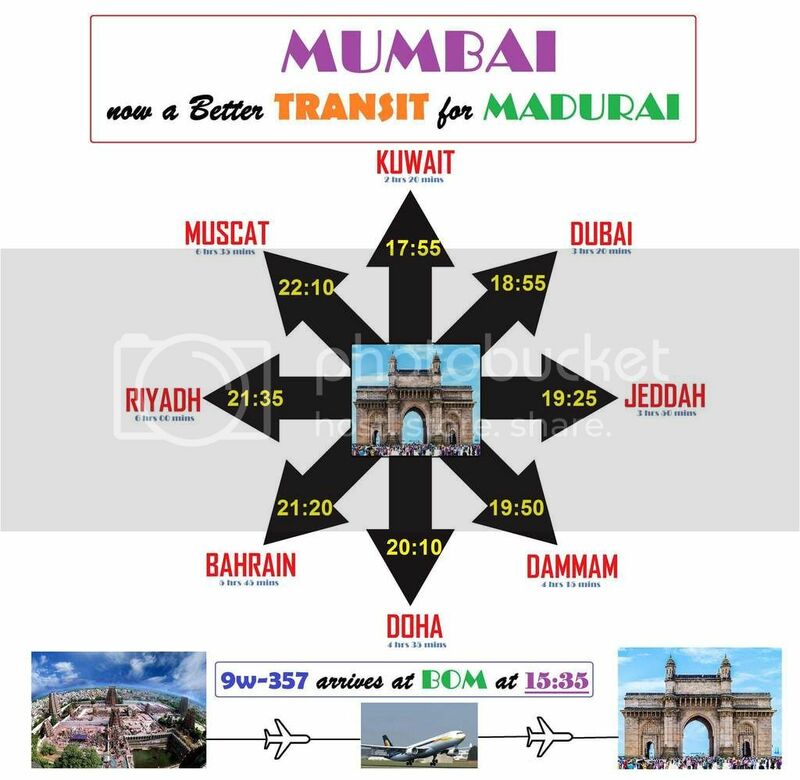 Not decent literally good connection to all metro & tier-i cities barring Calcutta & Ahmedabad. I am expecting before the year end even these two places will be connected with one stop service. I remember someone asked whether IXM can install 3rd air bridge. I think they need to do little work in apron to fit 3rd one. I also wanted to post an explanation regarding IXM apron. Disclaimer : I am not an expert in this. Just making use of information available to public and a little logic. If you look at the google map/world picture, you can see there is no bay in the line of 1st Aerobridge, but there is a bay behind 2nd Aerobridge. The apron is designed in the way that when the 2nd aerobridge is occupied, the bay behind it cannot be used. In other words, thought IXM has 7 bays, only 6 can be used simultaneously. Coming to the aerobridge part, one can assume with the type of aircraft mentioned in the AAI website that those are Code D aircraft. B767-400ER is the biggest code D aircraft with 51.92 m wingspan (52 m comes under Code E) and A310-300 is much smaller with 43.9 m wingspan, but still Code D aircraft. (Code D consists of aircraft between 36 m and 51.99 m wingspan). Note: Wingspan is not the only criteria, but it is the major one to decide. This is where our beloved AAI strikes. These type of aircraft are either no longer exists or very few exists that too in some other part of the world. The AAI designed majority of the smaller airports in India according to Code D. Majority of the aircraft (or should I say 90%?) operated in India belong to either Code C or Code E. So the basic itself is wrong for IXM apron. Point 1 : If you look at the google map/earth pic, you can very little concrete surface to the left of 1st Aerobridge. This makes it inconvenient for airlines to use the back-right side exit as the step ladder has to towed and towing vehicle might slip into the mud. You might ask me why airlines should use the back side door when the front door is connected to aerobridge. a) Airlines like Indigo often uses both aerobridge and back exit to board and deboard the passengers which helps their efficient turnarounds. 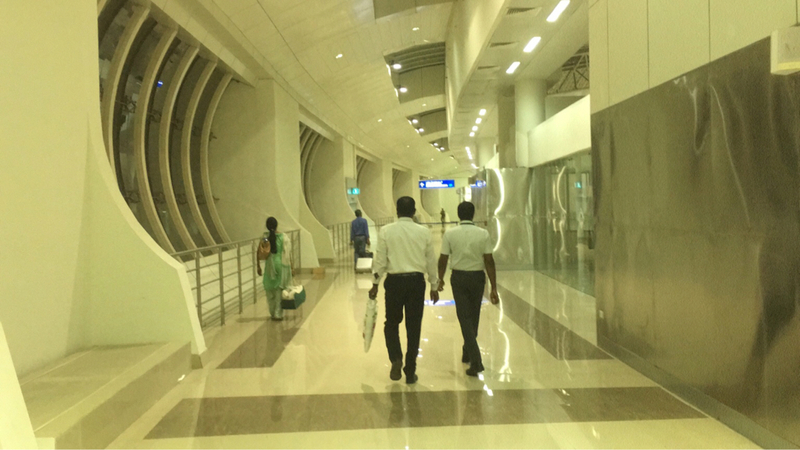 b) The important thing is according to DGCA guidelines, "Provision is made for the safe evacuation of passengers via at least two of the main passenger embarkation and disembarkation doors in the event of the emergency." This means it doesn't matter whether the airlines use the back-right side exit or not, they have to place a step ladder while refuelling as they need to evacuate passengers immediately in the time of emergency. Most of the airlines in India usually refuel in the destination airport for the return flight instead of carrying the whole fuel from origin station. Point 2 : There is unusual long pushback for both 1st and 2nd aerobridge as the aircraft has to be pushed back till the disused runway (which is used as taxiway). This is because, this part of apron is designed keeping Code D aircraft in mind and accordingly, we dont have enough space within apron to turnaround. Both the above points make airlines reluctant to use 1st aerobridge especially domestic flights which aim quick turnarounds. So airlines use it only when they are desperate to use aerobridge or when the other bays are occupied. According to the schedules appear in the booking engine of airlines, the peak time is 12:40 to 13:30 where we will be having three narrow body aircraft (1 A319, 1 A320 and 1 B738). Since we have 5 bays for these kinda aircraft and 4 can be used simultaneously, I dont think we need to worry much. Even in the case of delay of any other aircraft, we still have 1 extra A320/B737 bay and 2 ATR/Q400 bay. Charters can be parked in the disused runway as you can see in the above pic already that one small is parked there. b) Redesign the existing apron according to Code C. It will reduce the pushback length and inturn help airlines to have a quick turnaround. Redesigning according to Code E takes more space and lot of work and runway has to be upgraded. IMO, IXM doesn't need Code E aircraft at least for the next 10-15 years. IXM kinda airport usually plays with frequency rather than capacity. Thanks for the detailed report. AAI definitely need to re-design apron. In my recent visit, I saw concrete works are happening at the places I marked (red) in the below picture. Not sure about the purpose. Well, lots of thanks to Mr Mustafa for the exhaustive , painstaking efforts to analyse suggest an effective solution for the efficient utility of the aero bridges and parking bays , provided at Madurai Airport. think with the incraese in frequency and passenger traffic , the AAI authorities will extend the apron area concreting and contiguous facilities, to facilitate ease of operations. may be we should start requests to AAI, highlighting this requirement.let us hope for good. Thanks to Mr Sundar for the keen observation and instant response. wish more good things happen in Madurai. Some shots from my last trip.